Eli is terrible when it comes to changing his diaper. He has been since he was around 7 months old, and now that he is stronger it is worse. He used to just wiggle and kick. Now he kicks and flails and flips himself over grabbing on to the changing table in the process, so you have to physically remove his hands from the table. Of course in doing so you also lost where you were in the changing process and have to start over especially when he kicks everything onto the floor. 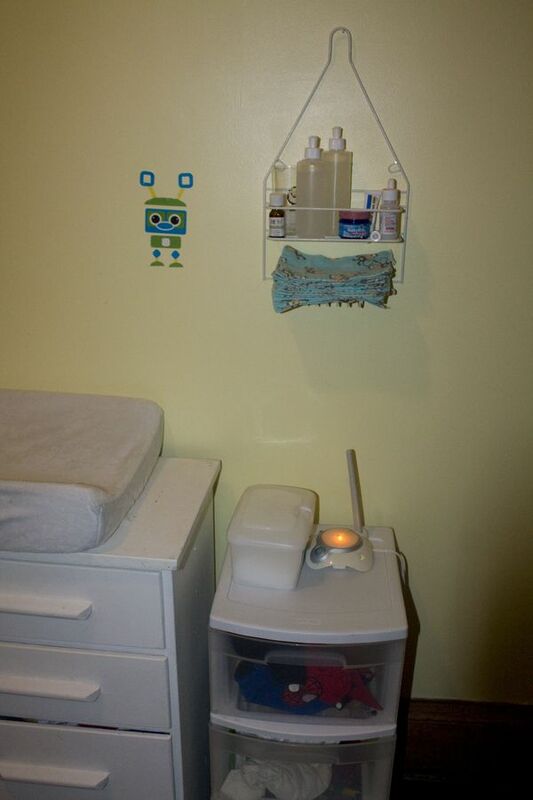 I finally got tired of everything being kicked to the floor and hung up a little bathroom organizer above the container I keep his diapers in. (Everything used to sit on the diaper container). It currently holds cloth wipes with two bottle of wipe solution, teething medicine, tea tree oil for his diaper pail, baby vapo rub, and a cup with the little velcro tabs I use on the diapers. I need to buy some more diaper rash cream (we like California Baby), and then it will go in there too. 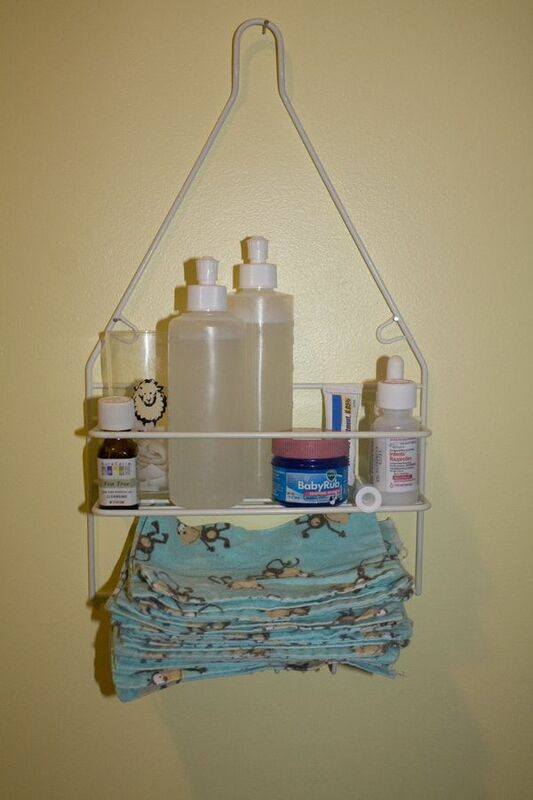 In case you are wondering those are peri-care bottles from the hospital with wipe solution in them. I just squirt some on wipes as needed. 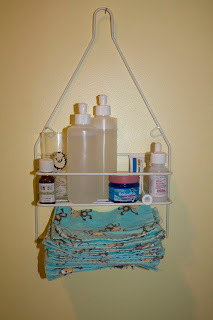 My wipe solution is warm water, a few squirts of baby wash, and a couple drops of tea tree oil. I used to measure it, but I guess I got lazy. The velcro tabs are used to keep my diapers from sticking together in the wash. Changing little tornadoes is hard enough without throwing snaps in the mix (we have a couple snap diapers, and they take at least 5 times longer to get on this crazy kid), so I am really, really glad I chose the hook and loop closure 5 years ago when I started! However, the laundry tabs do start working after a while. 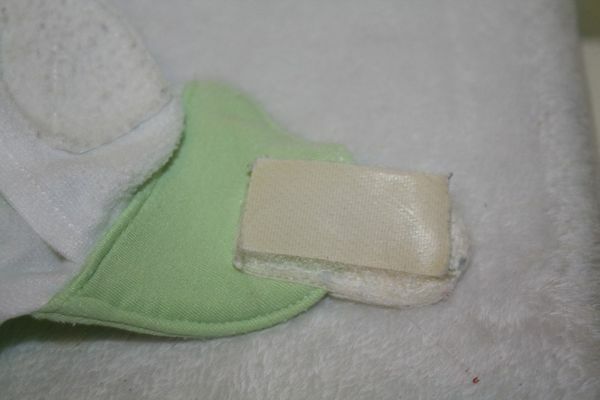 so I just cut up velcro to the appropriate size and put the little tabs on before throwing the diaper in the pail. At least for now, this little organizer has prevented my little tornado from scattering velcro tabs throughout the room!